They are also full of questions. “In Visitor Services,” he explains, “you help people learn how to use and enjoy the Garden. 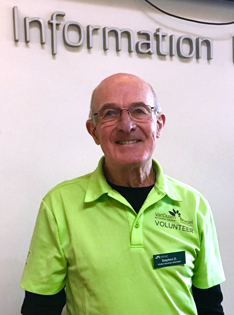 In person or on the phone, they want information — about a plant, an event, the location of a memorial tree or bench, it could be anything.” The volunteers are trained for their role and gain more knowledge with every shift, but they also have the help of a comprehensive binder, kept current by staff. “It is our constant resource,” says Steve.